A mother has spoken out about the verbal abuse she received for breastfeeding in a Belfast restaurant. 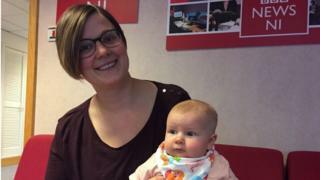 Liz Skelcher was feeding her 11-week-old daughter, Evie, in Nando's when the incident happened last week. Nando's says it is a breastfeeding-friendly restaurant that welcomes nursing mothers. But it was other female customers who targeted their abuse at Ms Skelcher, who described the experience as both intimidating and upsetting. Speaking to BBC's Talkback programme, Ms Skelcher said: "I was in the restaurant with my partner and mother-in-law when Evie woke up and needed a feed, so I lifted her and latched her on discreetly. "There were three young women at the next table and one, in particular, seemed to have an issue with me feeding Evie. "She told me we were putting her off her food and that it was disgusting to feed a baby in a restaurant. "She kept mouthing off in front of her friends and when my partner asked what her problem was, she said she didn't want to see my breasts when she was eating her dinner." Ms Skelcher explained the situation to a manager, who, she said, was sympathetic and stressed to the other customers that women are "more than entitled" to breastfeed anywhere in Nandos, Belfast Live reported. However, when the manager of the Victoria Square restaurant invited the three women to move to a different table if they felt offended, they refused. Ms Skelcher's group was then offered another table, but they also refused. "I felt like I hadn't done anything wrong, in fact I had specifically selected a table in a quiet corner of the restaurant so that I could be discreet. "It's not a display, it's not exhibitionism - it's just me trying to feed my daughter quietly." SDLP MLA Claire Hanna said more protection was needed for mothers like Ms Skelcher. Ms Hanna has proposed new legislation which would protect the rights of mothers and babies to feed in public and help promote the benefits of breastfeeding. "Breastfeeding mothers and their babies are protected by legislation in the UK and Ireland, but there is no specific protective legislation in Northern Ireland," she told Talkback. Ms Hanna said her bill would be modelled on recent Scottish legislation, which "created a clear and easily-cited piece of legislation for any mother or business owner to rely upon if challenged about breastfeeding in a public place". "Part of the problem is that those young women aren't seeing other women breastfeeding in public enough in Northern Ireland. There's a cultural and attitudinal problem that needs to be addressed." A Nando's spokesperson said: "We always encourage our staff to welcome breastfeeding mums in our restaurants."